The photo id for this photograph is 204, in the Buxworth album. This photo was thought to show the Yellow Cat in the background, but comments have proven otherwise. I think that I read on one of the forums, that the photo is of the school, but the Yellow Cat was the building in the background! 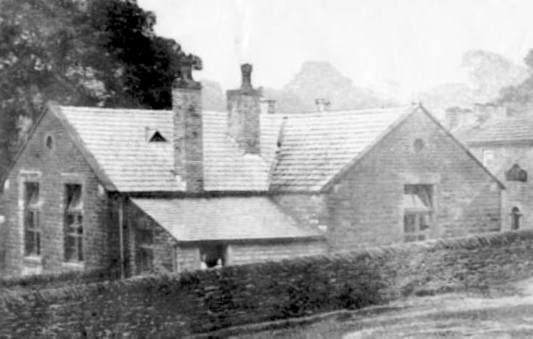 Sorry Paul, I think this photo is the primary school near Bugsworth Club and if so the pub in the background would be the Bull's Head. The Yellow Cat pub was at the bottom of Silk Hill. Thanks G.J. & R. S-S, so it was not the Yellow Cat, not misleading anyone now are we !!! Just to belatedly add to this discussion, the school is Gnat Hole School & the pub in the background IS the Yellow Cat. The Yellow Cat had (& still has) a distinctive stone-arched doorway, which can be seen in this picture, whereas the doorway to the Bull's Head has a standard stone lintel. Yes I know about the Yellow Cat and Gnat Hole School. Interestingly the feature over the front door also appears in the middle of the three cottages on Old Road in Whaley. At the Horwich End side you will see a white arch which was originally The Quiet Woman where the Top of Horwich Burial Society was originally founded.